DMV.com was created to help simplify your life by providing you with all the vehicle related information and Arkansas DMV services you may need, in one place. Quickly find information and services regarding driving records, vehicle registration, drivers license renewal, license plate renewal, getting a learners permit, and finding a Arkansas Department of Motor Vehicles approved traffic school. The DFA requires drivers license renewal for AR drivers. Find out how to renew drivers license credentials in Arkansas quickly and easily. Request your driving record today. Ordering AR driving records online from the DFA is a convenient way to get your DFA driving history. Visit our Arkansas online auto insurance center to obtain low cost car insurance today. Minimum auto insurance is required by the AR DMV. Attending an AR traffic school may allow drivers to get insurance discounts and dismiss tickets. Discover defensive driving course benefits. An Arkansas driver practice test can help you earn your license. Take a DMV practice exam online before you take the written license test. Learn about AR car registration services, including renewing car registration documents. Arkansas vehicle registration is managed by the DFA. Arkansas drivers ed classes can help new drivers develop safe driving skills. Learn about Arkansas drivers education benefits. An Arkansas car bill of sale is a receipt that records when you buy or sell a car. Learn how to fill out a bill of sale form from the AR DMV. Drivers who fail to pay Arkansas traffic tickets may face penalties from the DMV. Learn how to pay a ticket online in AR quickly today. A first DUI in Arkansas can lead to license suspension and other penalties. Learn about DUI laws enforced by the AR DFA. Learn how buying a car online simplifies Arkansas DFA registration. Before you buy a used car or new car, consult our resources. Get AR DMV locations and hours to help you get the DMV services you need. Arkansas DMV offices are located throughout the state. Cut out OMV’s bureaucracy. DMV.com has easy guides for drivers license, vehicle registration, license plate, emissions and other motor vehicle issues online. Welcome to DMV.com – our privately owned website that has nothing to do with any government agency, or government bureaucracy for that matter. We are your perfect guide to the Arkansas Division of Motor Vehicles, offering you useful information that will help you manage all those time consuming issues. Our articles are simple to understand and have instructions easy to remember. Motorcycle and boat owners can find useful information for their vehicles as well. Driver’s license, vehicle registration, auto insurance, ID issues, driving schools, driver’s manual…our articles have everything covered. The navigation around DMV.com can be done with the “search” bar you see at the top of the page, or the navigation sections. You would be surprised how quickly and easy the whole process can be. Join us and help us with your comments, feedbacks, edits…. Be our Facebook fan and and feel free to leave your comments. 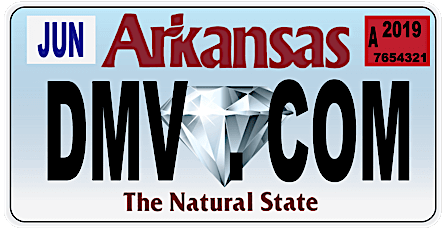 That way we will be always up-to-date with the latest Arkansas OMV requirements, forms to fill in, detailed info and much more.